While Bondi beachfront can be a whirlwind of too many beachgoers, backpackers, loud cars and average eateries, move back one block and it actually becomes what you could describe as tranquil. The early morning (ie before 9am) especially is quite a peaceful time and perfect for beating the mid-morning rush. 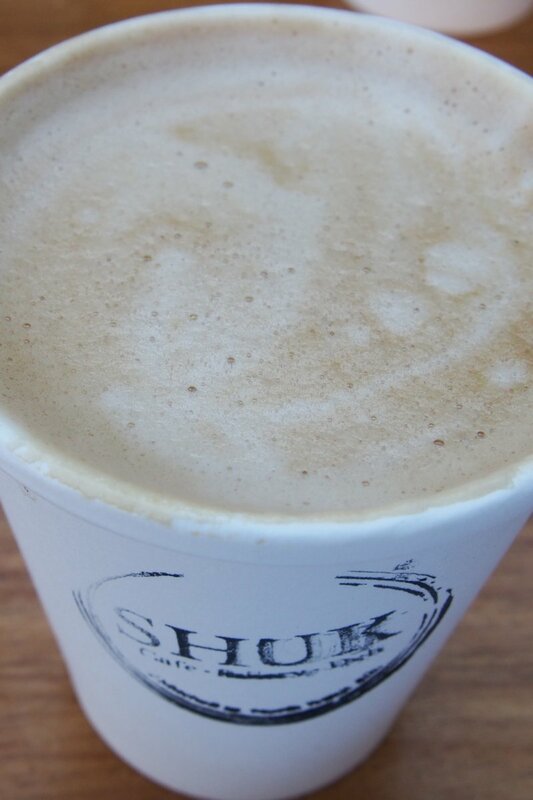 Shuk is located in one of these back streets of North Bondi and at this early hour, this sprawling café presented a whole host of dining options from the many tables outside the front to the large interior space. My dining partner this week brought her young son so we found ourselves in the outdoor play area surrounded by Fisher Price lawn mowers and soccer balls. While this presented an unusual type of surrounding compared to my usual exploits, we both decided when four other children descended upon us, that a fast breakfast was a good breakfast! Service was on the ball despite our distance from the kitchen so I have no complaints in that department! Our waitress obviously thought that we weren’t going to stay long (or that play area means paper cups) so we were served takeaway coffee ($3.50). I found it reasonable but have to say that it paled in comparison with my usual standard which was disappointing. On the beverage menu, you’ll also find young coconut ($5), home made lemonade ($4), banana smoothie ($6) and fresh orange juice ($5) among others. In-house baked goods! Huzzah! 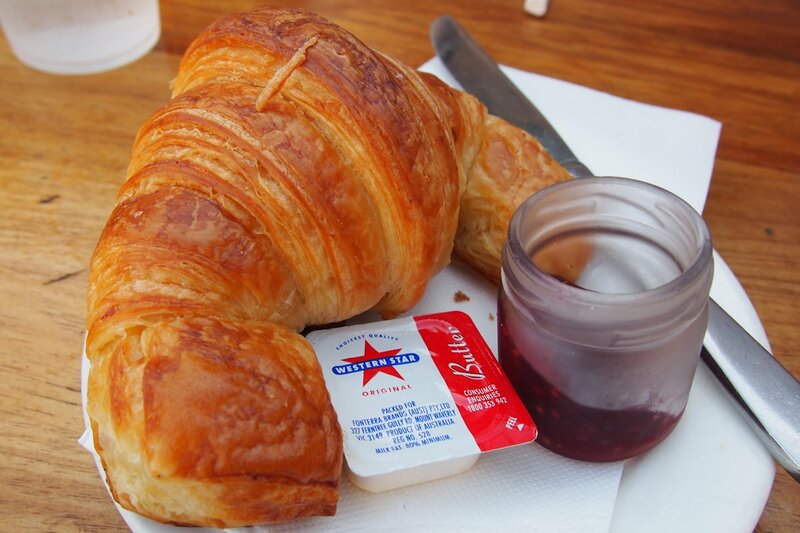 Our croissant ($3) was not to be messed with. It came to our table with outstanding textures and flavour to match. Everything baked is made onsite and also on offer are banana raspberry bread ($3.50) chocolate cake ($6.50), tiramisu ($6), Danishes (I had an apricot one and it was fantastic, $4), maamool (date & walnut, $2.50) and rogalach ($2.50). 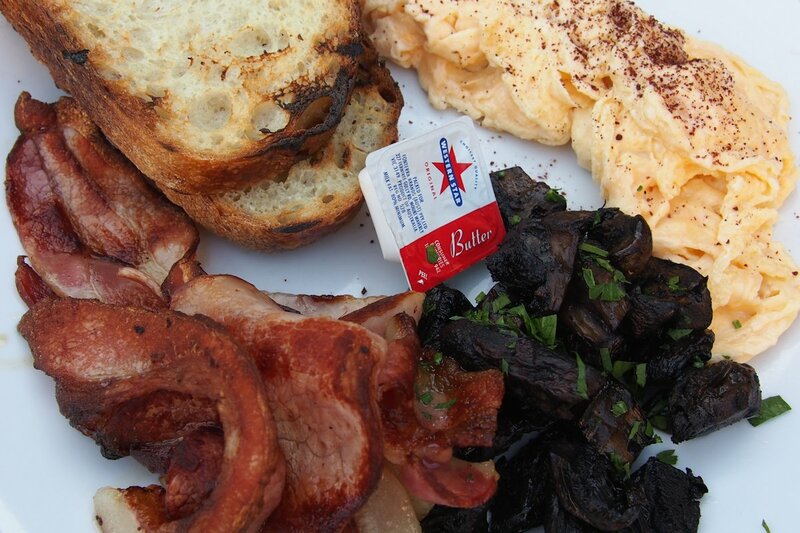 If you’re after something basic, the eggs on toast ($12) has you covered and can be ordered with the eggs scrambled, fried or 60/60 (60º for 60 minutes). Sides are abundant including bacon, chorizo, avocado, roasted tomato ($3.50 each), labne, ricotta, fetta or tahini ($3 each). The bacon was of good stock and cooked until crispy. The mushrooms quite simple, nothing groundbreaking here but prepared well and with care. I was pretty adamant even before arrival that because of the large Israeli population in the area, that I was going to order the shakshuka ($16). 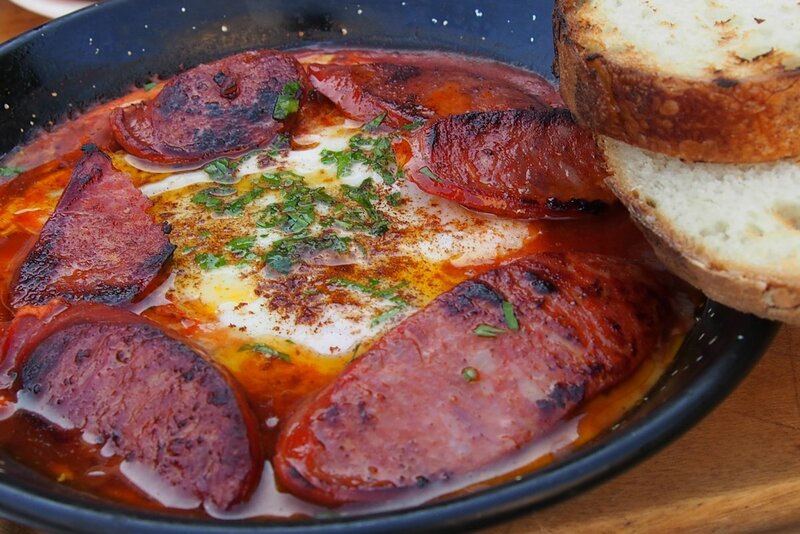 You can add kale ($3) or chorizo ($3.50) to the ‘regular’ red version or chorizo or haloumi ($3.50) to the green. The green shakshuka ($16) comes baked with eggs, fennel, zucchini, kale, caramelised onion, feta and olives. Sounds good huh, but I wanted to compare this shak to the numerous others (and baked eggs) that I’ve had before. The chorizo releases a lot of oil so be prepared for that but otherwise the baking time was spot on and the eggs were cooked just the right amount. The tomato base didn’t have anything memorable about it. While I enjoyed the dish, there was nothing that stood out for me. Other items in the menu include Beghrir pancake (cinnamon and lamond meal pancake with halvah, berries compote, crushed pistachios, yoghurt with honey & lemon glaze, $15), Israeli breakfast (two eggs, Israeli salad, olives, labn’e, hummus, butter, house jam, avocado, tahini & yoghurt with granola, $21) and herb omelette (herbs, kale, labn’e, Israeli salad & sourdough, $16). My main recommendation if you’re in the area would be to drop in for the fantastic offering of baked goods, you’re sure to be impressed! 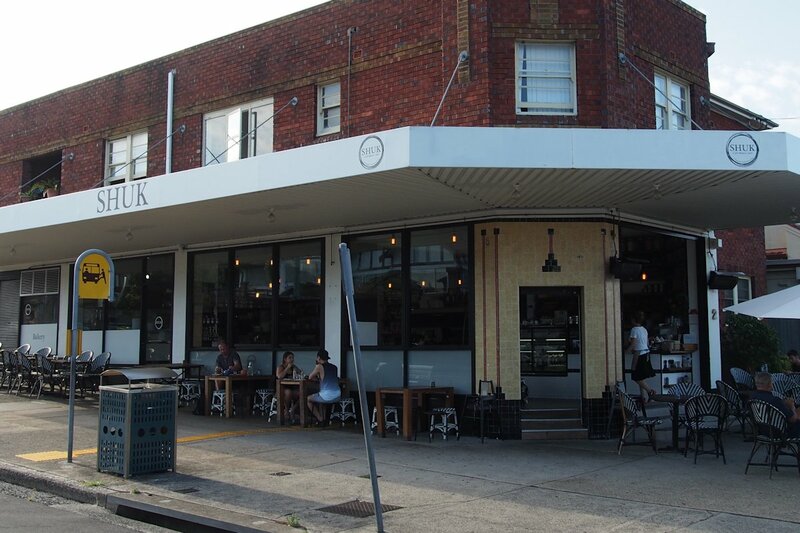 This entry was posted in Sydney - Eastern Suburbs and tagged Disabled access, Dog friendly, Outdoor seating, Parking close by. Bookmark the permalink.